The Inn of the Canal Otaru Furukawa’s Heartwarming Hospitality and Onsen! “Unga no Yado Otaru Furukawa” (Otaru Furukawa the inn on the canal) sits in the perfect location right in front of the Otaru Canal. Its nostalgic cool atmosphere blends in well with the feel of Otaru and is appealing. After sightseeing in Otaru how about spending some time being pampered by top class hospitality? If you already have bathed in an onsen, how about a late morning and a brunch? An opulent brunch while overlooking the Otaru Canal is definitely going to be a long lasting memory. The first thing that should be talked about of “Otaru Furukawa the Inn on the Canal” is the natural thoughtfulness in their customer service. When you return to the inn and they say welcome back you can feel the warmth behind the words and it is touching. Not only that they provide a hand drawn map of the area, a tile block print of some sweets and gift shops that they recommend, and you can feel that they are always thinking how they can make the experience for the guest better in their customer service and hospitality here. The onsen foot bath at the entrance is open to guests of the inn of course but also to non-guests as well. Hotel guests receive a towel as well. For a welcome drink they serve original Otaru wine, green tea, tea, and in the winter sweet hot sake. The sweet hot sake is warmed on the stove in the lobby and is made by a local sake maker. The welcome drink isn’t just given once, but when you check in, return from sightseeing, and for the before dinner check in. It undoubtedly warms your heart and your body when you visit here. It is recommended to enjoy the high quality onsen in the morning and at night! Otaru Furukawa has two separate large baths. The first floor has the Ichinoyu which is built like a stone warehouse, and on the second floor is the Ninoyu which exudes warmth with its wooden build. Pictured here is the outdoor bath of the Ninoyu. Ninoyu turns into a snow viewing bath during the winter, and the indoor bath has a “shrine”. The lay down bath “Hokora no Yu” feels like a cellar, and the herb bath has ample sunlight and the warmth from the wood bath making you bathe longer than expected. Ichinoyu is built completely different in atmosphere. The indoor bath is built like a warehouse in Otaru. The outdoor bath has roof tiles along the wall and boulders in the bath. The day is split into men’s and women’s bath times so you should definitely check out both baths. The amazing thing here is that they have a selection of over 20 different shampoos from various makers on hand. If you use a shampoo on the market you don’t have to bring your own. If you want a private onsen bath make a reservation! Make a reservation for the private bath with a view (50min/2,200 JPY) if you want some privacy. A bath with close friends, or the family while looking over one of the best night views of Hokkaido is something special. Inside the modern Japanese style inn, built to mimic a traditional traders house you can walk around in special yukatas provided for you. You don’t have to change for dinner. There is also a retro chic library that is strangely familiar and warming to travelers, where you can relax after a long bath. This is the view from the room on the canal side. You can look out over the famous tourist destination of Otaru Canal and the Sea of Japan. From here you can view the canals lit up at night, the historic warehouses painted by the setting sun, and the rising sun glistening in the morning. Being able to see the Otaru Canals when there are few people is a rarity reserved for guests of the inn. 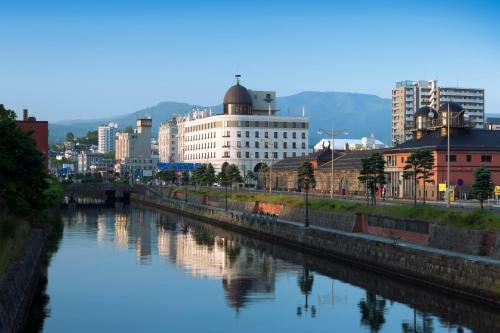 If you are staying on the city side you still have an opportunity to enjoy the view of Otaru Canal from the restaurant so be sure not to miss out on such a spectacular view. An extremely luxurious brunch! Which do you want Japanese or western food? The seafood here at the inn is the highlight of the meals. There are guest plans with dinner included and you can also head out into the city and eat in the entertainment district, but we really recommend eating the breakfast at the inn to taste some of their prize cuisine. If you want to experience luxury make a reservation for the Brunch Plan. Pictured above is half western and half Japanese menu, and this isn’t even all of it! Brunch for 2 didn’t fit on the large table at once. Add to it that this brunch plan is reserved for seats overlooking the canal. With sashimi and carpaccio for breakfast, freshly baked bread, a pot full of freshly cooked rice… you definitely have to take your time to enjoy all of this delicious meal. The brunch plan starts after most are finished eating the breakfast buffet and are ordering their drinks, so you pretty much have the restaurant all to yourselves. You can leisurely take your time to eat and take in the scenic view. Otaru Furukawa’s hospitality isn’t just in their customer service but you can feel it in their amenities as well. The face wash set, a sheet that takes the fatigue out of your feet, and in winter heat packs, moisturizing pack, and a toe separator, all of which help guests relieve any tiredness they have accrued during their sightseeing. In the morning they also serve you coffee and have morning music piped in. On the first floor is a massage chair free to use. This is the perfect in whether you want to see the sights actively or if you just want to relax and take in the city of Otaru’s atmosphere from the comfort of the indoors. With Otaru Canal right in front of you and many tourist spots as well as JR Otaru Station only 10 to 15 minutes’ walk it is definitely convenient. Otaru is defined as being retro, and nostalgic, which you can feel through this inn in boat loads. If you want a relaxed yet a central point for sightseeing in Otaru head to Unga no Yado Otaru Furukawa.